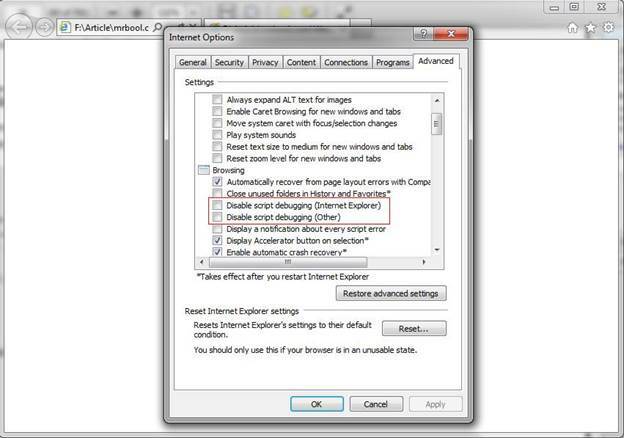 As you can see the Figure 1, it is the settings of Internet Browser 7, how you can change the settings? First of all open the browser and then go to the Internet Explorer Settings, after this click on the advanced tab, you will see the Figure 1 window in front of you. 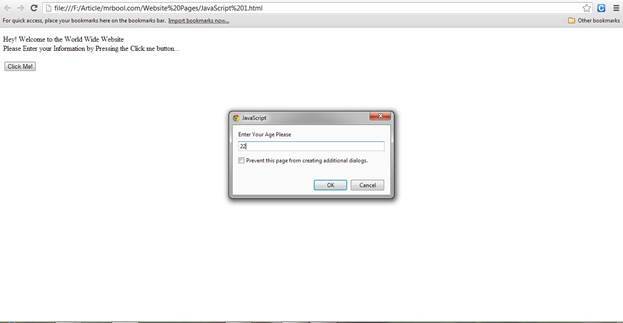 Here you just disable the script debugging (other) option. And click on OK button to apply or click on apply first then press OK button. 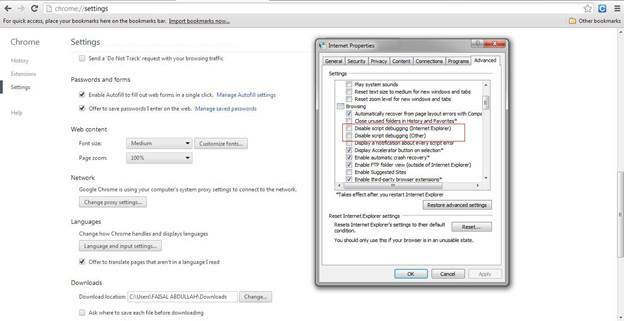 As you can see in the Figure 2, Open your Google Chrome browser, then go to the settings and then click on the advanced Settings, once you clicked on the advanced settings then click on the proxy settings, you will see the same window as you can see it in Figure 2. 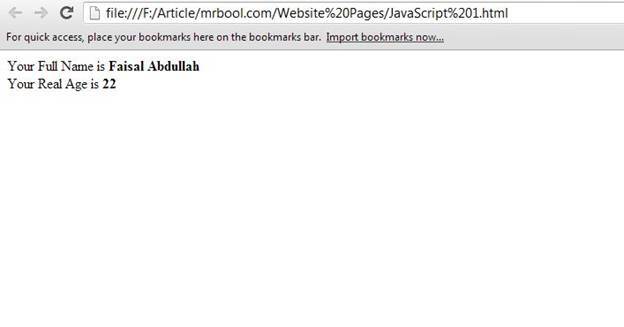 Here click on the advanced tab and go to the list to disable the script debugging (other) options. How to get input from the User at RunTime? In the above Figure 3, the program is asking to press the button and then you will able to input your data to the pop up boxes. In the Figure 5, the window is showing to input your age now, when you entered you name in the previous pop up box. In the Listing 3, we used three functions as sending arguments and returning values, sending arguments not returning values and also a function which not get any arguments either don’t return values. And we also used simple IF else statement. Now we will discuss the Array with their types, and we will also use loops to get the output of the arrays on the browser. The using of Array mean that the data is Homogeneous in the Array. Let’s check the Listing 4 for details of Arrays and using of Loops. In the Listing 5, we used to declare the properties of object then we used it in the document.write() method to output the data on the browser. As you can see we use (.) dot operator, to link the data object with the property of the object to execute the data from it.